The ancient Andalusian city of Almeria lies sheltered at the base of a bay, proudly dominated by the amazing Alcazaba, a huge Moorish citadel with three walled enclosures dating from 995. A 16th-century Christian castle was built on the foundations of the original Moorish citadel, creating a potent aesthetic mixture of architectural styles. From the citadel visitors have a good view of the city's most impressive and important Christian monument, the Cathedral, dating from 1524, designed more like a fortress than a church because of the need to defend it from pirate attacks. The Cathedral contains numerous art treasures, including a tabernacle dating from the 18th century and designed by Ventura Rodriguez. With its interesting medieval architecture, Almeria's old town is a delight to stroll through with its tranquil squares, archways and colonnades. The city also has a fascinating archaeological museum and unique cave dwellings in the hillside above the old gypsy quarter. 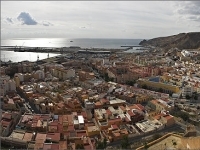 The ancient city's breathtaking scenery is advertised by its popularity with film makers; many famous movies have been shot in Almeria, including Never Say Never Again (James Bond), Indiana Jones: The Last Crusade, Lawrence of Arabia, and Patton.